I have a precious friend that lovingly speaks truth into my life as well as the lives of countless others. God provided to her the following insight and she graciously is allowing me to share it with you. 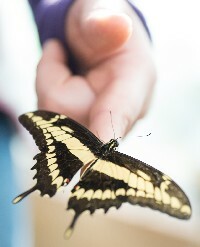 As butterflies flutter by, they often capture the attention of children. Have you ever considered teaching your child that, in many ways, they were created to be like a butterfly? 2 Corinthians 5:17 tells us: Therefore, if any man is in Christ, he is a new creature; the old things passed away, behold new things have come. The caterpillar was created to be a butterfly, just as we were each created in God’s image to have a relationship with Him. Neither one can achieve the purpose for which they were created in the state in which they were born. The caterpillar’s body blocks him from flying free, just as original sin blocks each of us from a relationship with holy God. While a caterpillar must be changed through metamorphosis to achieve its purpose, so a person must be changed by being born again by the Holy Spirit to achieve their purpose. The caterpillar achieves its purpose when it flies free as a butterfly, and each person achieves their purpose for existing when they receive Jesus as Savior & Lord and live in freedom, no longer enslaved by sin and death. As a parent, you have the amazing privilege of teaching your children that they can experience the abundant freedom only a life in Jesus can provide. The best way for a parent to train their children to walk in freedom, is to consistently demonstrate it in their own life. It’s safe to say that we don’t see butterflies returning to life as caterpillars, inching along on a leaf or the dusty ground at a snail’s pace. Neither should we crawl through life mired in the pain of guilt, worry, and fear. Isn’t it time we embraced all that we’re promised in God’s Word and… “Fly Free”?! Through Carla’s teachings on parenting, I’ve been able to grasp HUGE God-sized Truths, apply them to my own heart and life and then teach them to my children in a way I’ve not been able to before reading her study. It’s changed how I parent for the better!